Thousands turned out to hear President Franklin D. Roosevelt speak at Fenway Park. As the Lansdowne st. gates of the park opened to admit the President’s car, exactly at 9 p.m., a wave of cheering broke out which beat across the night in a steady, growing roar. It continued as the ramp was cleared of speakers, lights and microphones adjusted, and as the big open car was driven onto it so that the President sat 10 feet above the ground. Announcers tried to still the crowd as he started to speak but they continued their roaring welcome until the President himself brought quiet by reminding them over the loud speakers, in a shout, that radio time costs money. At 2:30 o’clock yesterday afternoon there was a crowd in Fenway Park big enough in itself to be an audience for a good-sized political rally. The crowd was composed of workmen getting the park ready, with facilities and decorations, for the 40,000 people who would sit there a few hours later and see and hear the President of the United States. The crowd consisted of carpenters, radio men, electrical lighting equipment men, awning and bunting decorators and workers setting up seats -- several hundred in all and everyone working at top speed. Red, white and blue bunting and banners were looped along the infield fence, around uprights and the edge of the grandstand roof. A large crew was busy putting up Roosevelt, Tobin and other state candidate banners. Eight huge clusters of floodlights were erected around the infield, each equipped with loudspeakers facing in all directions so that speeches could be heard in every corner of the big park. In the exact center stood the huge wooden ramp upon which the President’s automobile was driven. Special flood-lights were focused upon this ramp and radio microphones were set up so that no matter which way the President turned while speaking a microphone was before him. At 2:30 p.m. the first of the 40,000 persons that was finally admitted to the ball park arrived -- three women and four men. They women had folding camp stools and they sat down at the Jersey st entrance to the park. They wanted to be first on hand and be sure of goods eats. They were there 15 minutes before others started to arrive. By 4 p.m. a crowd of 500 were at the Jersey st entrance. At the Brighton railroad yards a crowd of 500 had gathered before the Presidential train arrived at 5:20. There was nothing for them to see except the train in the distance, but they stood patiently on Cambridge st, eagerly watching every car that arrived and departed. Police acted cleverly to avoid a crush at the Brookline av and Jersey st gates, where a huge crowd had collected, by opening first the gates on Jersey st, where a much smaller group waited. The effect was to divide the host at the larger entrance, many of whom moved to the other gates. Sound wagons blaring out campaign and patriotic songs gave the streets around Fenway Park a holiday atmosphere. The crowds were jovial for the most part and took the widespread jostling in good humor. More than 250 newspaper reporters were instructed by Secret Service men to meet in a garage on Ipswich st, whence they were marched in columns of threes at 8 o’clock to a side entrance of the park. 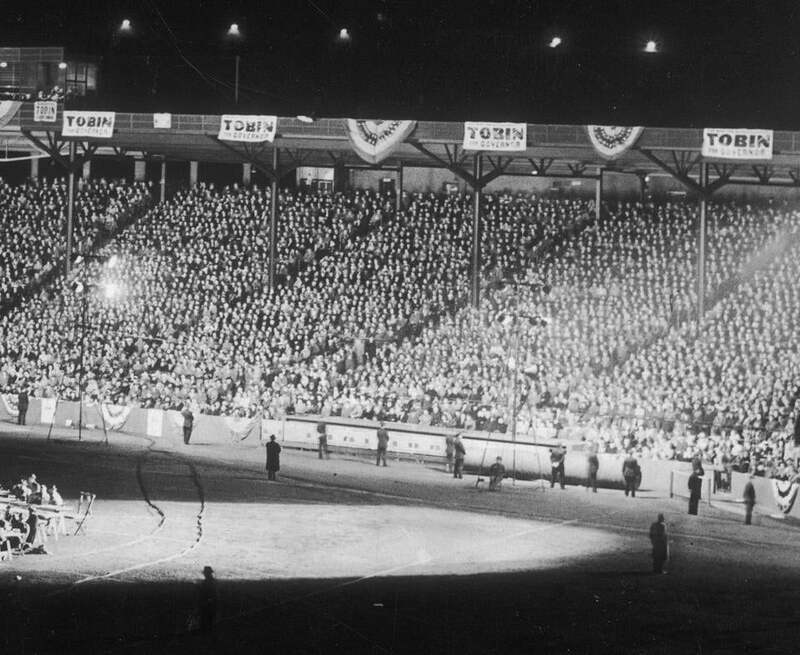 The big football scoreboard at the ball park read significantly as it did on the final play of the Boston College-Syracuse game “4th down -- 3 to go,” and observers noted it was the final speech of the campaign with three days remaining before Election Day. The “Bobby sock” fans began to squeal in delighted delirium when Frank Sinatra started to sing the National Anthem, but their elders quickly shut them up. The crowd roared its enthusiasm as Orson Welles and Frank Sinatra were introduced. The “dramatic voice” and “The Voice” talked in that order, the audience delightedly applauding each at frequent intervals.